Several people have been asking me for the DIY because its a little tricky to find being it was orig. posted this in the headliner thread. So here it is!! Don’t have the door panel off? Go buy a "trim panel remover" from Napa or Shucks. There are other thread on here that explain this but real quick to save you guys some time…Unscrew everything you can from the door (two screws by the door handle behind a plate, removed the door handle), and then start from the bottom by the speaker and run the trim panel removed along the bottom until you bump into the clips, straddle them with the tip and apply some leverage and POP goes the clip. There are several around the door. I'll post a pic at the end of the clip placement. This is a picture of the door panel off, power window part removed along with lower part (to get this off, you need force, you actually need to break it off, there is several rivets (three I believe) a hook, and another connector piece under the front armrest. For me, I broke this off thinking I needed to remove it to get the door off, you dont. Later on, you'll want to break or dremel it off to make the instal quicker and avoid wrinkles. Good news is its not necessary and it will stay in place even with all this stuff broken (as long as you don’t break the hook it’ll be easier on you- which I didn’t break- its built pretty sturdy, but if it gets broken oh well, everything on the door is fixable with epoxy paste and an overnight drying). If you want to fix it, which is recommended, pick up some epoxy paste that dries overnight at a hardware store. Mix it together with some putty knives and mold it around the broken pieces. Let it dry over night, and they are fixed. I can help you with this if you need more help.) I removed the fabric by just yanking it off starting at the power window area. I slid my trim panel remover in there to loosen it up and just started yanking. I removed the adhesive with some goo off (didnt work that great) so I moved to a razorblade, worked pretty well but time consuming. I took the panel outside and sprayed it down with water to removed the dust, chemicals, and all the other crap, followed by drying it off. In this picture, the arm rest is on, although its only held in by two metal clips on either side, one of which I broke, but patched back up with epoxy paste, dried rock hard- good as new. I put the armrest back on to see how far the fabric had to cover. Tape all the areas off so you don’t get adhesive over spray. Don’t want your passengers arms sticking to your door! I ran some tests with the adhesive spray on a large piece of cardboard I had laying around to see what the spray pattern was like and how I was going to work with it. It came out quick, and nothing like a spray paint can, which I'm pretty famil with, heh. But the important part was that I now knew what to expect. I also noticed how long it took before it dried up. Which for me, gave me about 30 seconds to lay the material down after finishing the spray. (Don’t worry about tucking the edges in as of now, we'll go back and push them in there with a putty knife or flathead screwdriver to get them in there) I realized I couldn’t do the entire panel with one spray, so I did it in sections. However many sections you do is up to you. I used cardboard to cover the fabric from over spray. This is a two person job. I had a friend helping me. He held the fabric up in one hand, and the cardboard in another, I sprayed and spread the adhesive with a finger, wiped it off real quick as he tossed the cardboard aside, and we laid the fabric down- he held it above and I slowly smoothed it over the adhesive area. At the end, I had about an extra inch of material left over, no biggie, just cut it off. Oh... I should mention here I used microsuade and started from the front of the panel and worked my way to the back. Apparently, the fabric I had precut and set aside ended up touching some of the chemicals that I tried to remove the OEM adhesive with. Stained the fabric, which was covered up by the pocket on the door so I wasn’t too worried, but some of the adhesive actually bled through the fabric and made dark blotches. These coupled together pissed me off. To tuck the fabric in around the edge, I used a flat head screwdriver. I turned away for a little bit and had my friend cut out a second piece of fabric for us to lay. As I’ve said in previous posts in this thread, the 3M # 80 does not work to bond two fabrics together. Rubber cement works wonders, with an amazing hold. Laying the fabric down was much easier because rubber cement doesn’t have over spray, and the previous over spray was dried, so spent less time worry about the fabric getting messed up. Now, before I show you what the final product looks like, I want to explain the clips real quick. Here is a picture of where the clip placemnt is. One clip near the bottom had broke off, oh well- I’m not running to Honda to get another one-my door will stay on as you can see by all the other clips. [update- door rattles in that particular section- note: find clip and epoxy to door panel] One other clip on the side stayed attached to the door (top right of the speaker). To get the clip out of the door, I just grabbed it with a pair of pliers and slid it back in the door. Following the door panel are some close ups of the two clips I’m talking about, you can see the difference. Here is what it looked like with both layers on (using rubber cement for the second layer). Hope that helped clarify any of the questions you guys with the coupes had that wanted to do microfiber. If not, I’m here for questions! POST PICS IN HERE OF YOUR COMPLETED DOOR PANELS!! Last edited by TRIZ; 04-03-2007 at 04:07 PM. great DIY great project, geat everyhting... if i could rep you i would... now im still searchin for some green microfiber, suede, or something. Will take on this task this weekend most likely, i save up some funds. Nice Job Triz that's cool. I did my headliner in the same material. But I didn't like it so I ripped it off! Ha ha, oh well I want to do something crazier. Nice to see new DIY's. Good job. AWESOME DIY!!!!! Now I have a project over the summer. I have all black interior but I think a royal blue suede would look tight in my car. Im kinda excited! Arent the pics showing up? Maybe this will make it in the DIY section... anyone think its worthy or not? I think it is. I am going to get mine done once I get it back from the shop. I already bought the royal blue suede. I'll get some pics posted once I get it done. Werds, Wouldnt mind. ^^ I was looking at the rsxs cluster. Got the ***** for that one? I'll be back in portland next wednesday late night for my spring break- pushing a week and a half, yeahhh bahbay!! I know a bunch of you guys are doing this over the weekend, post some pics up after you get it done!! nobody finished over the past couple weeks? Oh yeah, when I was out on my spring break last week, I popped in a store for you, which had been really dependable for me- but just a differnet location then I usually go to- and they didnt have any green, any red, any microsuade at all!!! Microsuade isnt cheap. 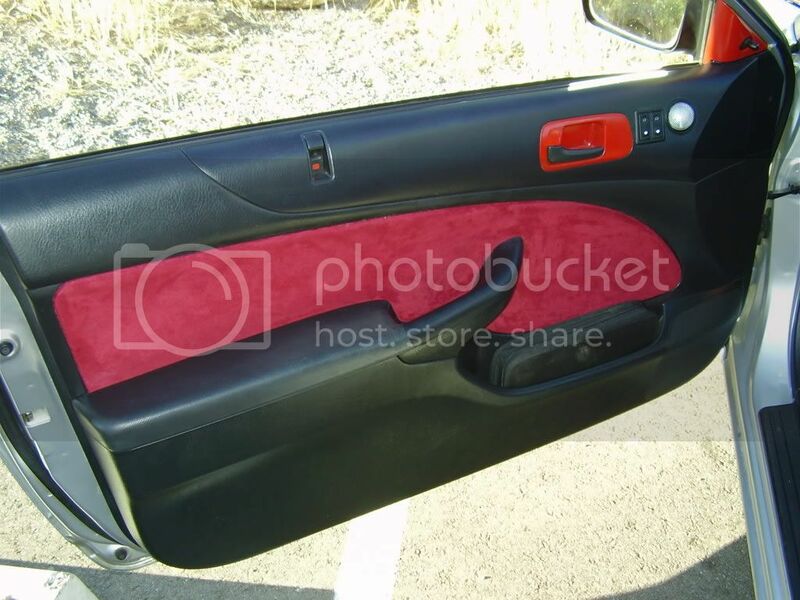 I think it costed over 75 for me to do this to my doors a few months back, and that doesnt include the multiple tests that I did on adhesives and fabrics and processes... blahh blahh blahhh.I wanna add this to the back of my coupe somehow now!! You'll have to let us know how it holds up in the sun... Did my headliner on my old Mitsu. about 5 years back using #80, and with the heat from the sun the headliner just pulled away... I could never find a adhesive that was that tollerant of high temps without getting weak... The again I was bonding fabric (the headliner) with fabric... Maybe that was the difference?? Ohs well...... that car is long gone NEways.. Nice DIY though!! last two pics in the previous DIY..
^ I think he did vinyl on his. Last edited by booba5185; 06-03-2007 at 04:57 PM. 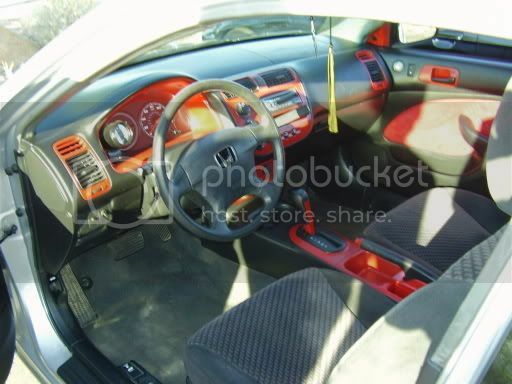 u have red in a lot of weird places... hey triz ur interior should be black..how come its tan? 2001 LX... I didnt want black, I wanted champagne- player player!! booba5185 - looks pretty good- I wanted to do something with the rear seats, but ****... I dunno what exactly. Hmm.. hopefully I'll think of something... I dont trust my passangers in the back with micro suede back there, as it is- anyone whos sitting in the back looks at my ceiling and draws in the microfiber for the entire ride. 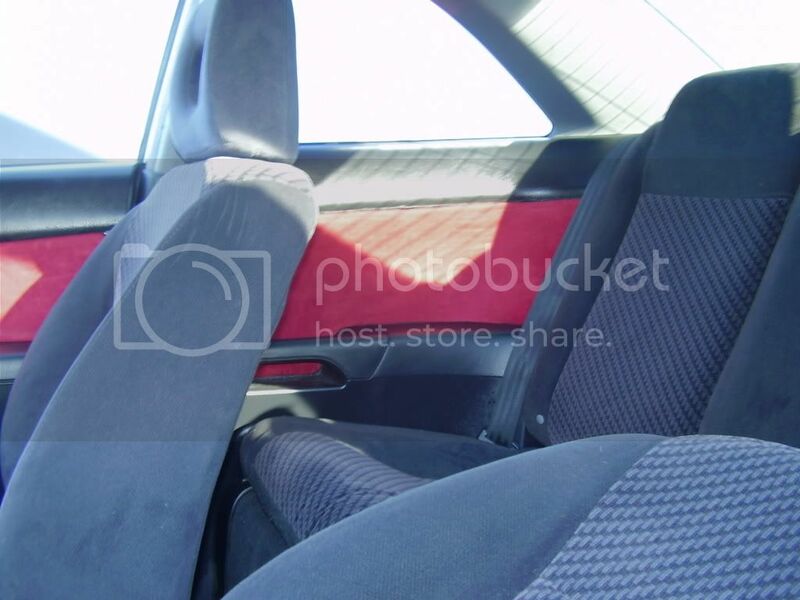 I tried 2 things, on the passenger side, i took a dremel and cut accross the top so the fabric could go through, also cut the bottom, by the armrest <---horrible idea, do not try it lol, i was 18 and stupid lol. On the driver side i got a circular fabrib knife, masked it off, and got a nice think coat of glue, then cut it along the line. In my climate it didn't work cuz 140 degrees in side the car can tend to make glue wet again lol, in Oregon, it MIGHT work, good luck.